To make school lunches and summer picnics even more super, add some Teen Groot Bread to spice it up. I love a good themed Avengers lunch, and since we already have a Captain America lunch box, we’re one step closer to being Marvel-ous. 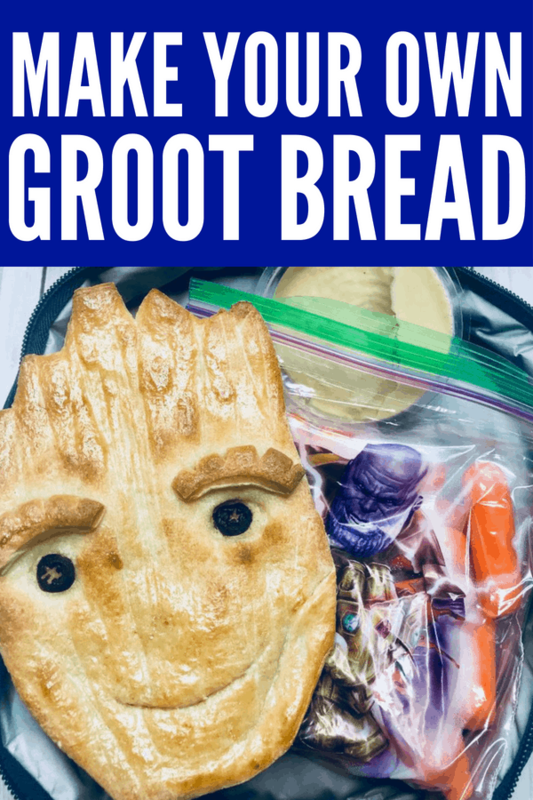 Here’s how you can easily make Teen Groot Bread! This is the first year that all of my children are in school. While I appreciate the freedom it allows me to do things for myself, I also miss them. Making cute things for lunches or writing notes is my way of letting them know I’m thinking of them. It’s their love language. Y’all know how much I love Marvel, especially Captain America. Well daughter #3 inherited that same love. She has been carrying that Captain America shield lunch bag around for years. It’s not always easy being a young Marvel fangirl. When some little girls are into My Little Pony or Descendants, then sometimes they don’t understand your excitement over superheroes and Stormtroopers. So yes, baby girl, let’s rock this galaxy with some Teen Groot bread and an Avengers lunch. When I went to Disneyland for Summer of Heroes, they had Groot Bread, and I was obsessed. However, they no longer serve it, womp womp. So I decided to make my own! I tried watching a video of Disney’s of how they make it. Don’t follow that video. That unicorn horn Groot they made is not the one they were selling. Trust me, I ate enough of that bread. You can use your favorite bread recipe to make dough, but I just use already made pizza dough in the refrigerated section of the grocery store. Also, mine are Teen Groots. The ones they served in Disneyland were gigantic. Mine are smaller for easy transportation. Plus, I adore Teen Groot after watching Avengers: Infinity War, attitude and all. Preheat oven to 400 degrees. Then, roll the dough flat. You don’t want it too puffy or then Teen Groot looks like the Stay Puft Marshmallow Man. Next use a pizza cutter to shape Groot. In the video I watched, they showed where to make the cuts for Groot’s head. Well, they were wrong. I suggest just free handing it. The best thing about Groot is that he’s a tree, and it doesn’t need to be perfect. Next use your pizza cutter to make lines up and down the face and head. You don’t want to cut all the way through the dough, but cut the lines deeper than you think. Then use the pizza cutter or a paring knife to make the smile. I did cut all the way through to make it a little more prominent. To cut circles for the eyes, I used the bottom of a metal decorating tip. Don’t cut all the way through the dough, but almost and then add the black olive. I cut a flat piece at the end, so that the olives would sink in a bit. A half or a whole olive will make the eyes stick out which is fine if you prefer that look. Next, make the eyebrows by cutting a little strip of dough and then cutting about 4 slits with a paring knife. Spray water on Teen Groot and add the eyebrows. Ta-da! I used a large metal spatula to transfer my Groot to a cookie sheet covered with parchment paper. I lightly brushed egg white over the dough to make Teen Groot shine. Then place in oven for about 12 minutes. Keep checking on the bread to make sure he doesn’t burn. 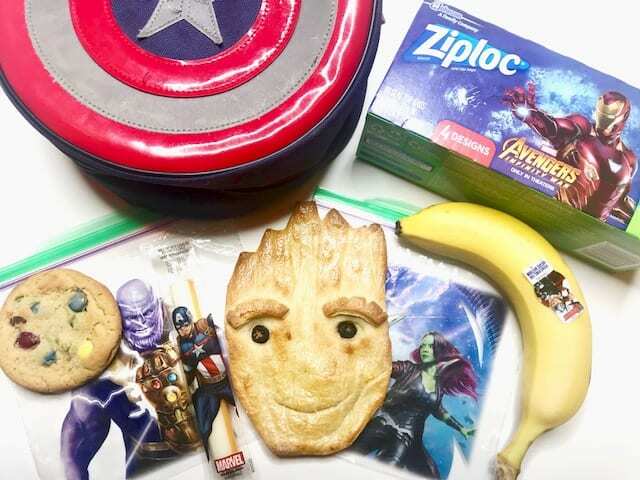 With different Avengers bag designs, you can add pizazz and fun to any lunch or snack. Use them for school lunches, a picnic in the summer, or even an indoor picnic at home. We also found some Avengers cheese sticks and bananas (’tis the season) at Walmart, and I added a small travel pack of hummus for the bread. For a sweet dessert, we have an “Infinity Stone” cookie. Now go forth and let your fan girl flag fly, daughter. If you want to dance to your own Guardians of the Galaxy Awesome Mix in the hallways, be my guest. You are Groot. Have fun making your own Teen Groot Bread! These would also be great for an Avengers party! If you need ideas for an Avengers movie night, check out this complete list of Marvel movies in order to watch before Avengers: Infinity War.